Haven't heard of the Kobo e-reader? You will soon, this e-reader underdog has got what it takes to compete with Amazon's Kindle and Barnes and Noble's Nook. For starters the Kobo just announced an impressive Wi-Fi model, Kobo 2, priced at $139 - the same price as the Kindle. But that's not all. Just as Kindle does, the Kobo has an on-device bookstore that makes buying books a snap. Under the hood the Kobo 2 has a faster processor, which will hopefully fix the sluggishness that drags down the current model. It's also a little bit lighter -- 7.8 ounces, compared to 8.5 ounces for the Kindle -- but a hair thicker, measuring roughly 0.4 inches to the Kindle's 0.34 inches. 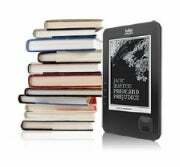 Despite the competitive price and impressive specs the Kobo does face hurdles. Its biggest challenge will be getting under the nose of buyers. While Kobo is sold at Borders book stores, the Kindle is sold at Target and will be sold at Best Buy. The Nook is sold at Barnes and Noble stores. Plus, Amazon has name recognition and three years of Kindle software experience on its side. Still, don't write off Kobo as a growing e-reader platform. The company is starting to get some love from other hardware makers. It's the featured e-book platform on Samsung's Galaxy Tab and Blackberry's PlayBook tablet. Throw in apps for iPhone, iPad, Android, BlackBerry, PC, Mac and Linux, and Kobo is a bigger platform than Kindle and Nook. If I sound a little gushy, it's because there's a lot to like about Kobo. A couple weeks ago, the company published "The eReaders Bill of Rights." Among its tenets: Users have the right to read e-books from libraries and load DRM-free books in ePub format, and shouldn't be subjected to DRM-laden books if the publisher doesn't demand it. These views are surprising -- refreshing, even -- from a company whose primary business is selling e-books, and Amazon does not share them. The reality of e-books is that, at some point, you must invest primarily in a single vendor, lest your library be scattered across a handful of virtual bookshelves or physical devices. Kobo's new e-reader provides comparable hardware to the Kindle, so the overall platform looks better. It still lacks the frills of a Kindle or Nook -- it has no games, music or Web browser -- but if you're looking for a vendor with liberal views towards digital rights and library e-books, Kobo's got the cheapest hardware and the biggest platform.